The CSR and outreach unit of the Association of Development Financing Institutions in Asia and the Pacific (ADFIAP), the focal point of currently 127 member-institutions in 44 countries and territories engaged in the financing of sustainable development in the region. The ARC Institute capitalizes and builds on the many years of ADFIAP’s experience, network and partnerships in the area of financing sustainable development initiatives, more specifically, in relation to environmental, governance and social (ESG) issues. This microsite provides the basic information on The ARC Institute and how it works to serve its constituency. An international seminar-workshop entitled, "Institutionalizing Responsible Corporate Citizenship in Development Financing Institutions" was successfully conducted from March 27-29, 2012 in Manila, Philippines under the auspices of the World Federation of Development Financing Institutions (WFDFI) whose current Secretariat is ADFIAP. 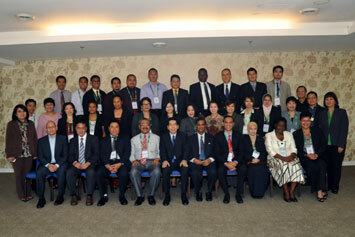 The event was attended by 26 participants from 20 institutions and 14 countries in Africa and the Asia-Pacific region. The program served as a platform for the participants to share country experiences on development finance, corporate governance, corporate social responsibility (CSR) and corporate citizenship (CC). This program which is under the CIPE grant-funded project called, “Responsible Corporate Citizenship for Development Financing Institutions” aims to promote, develop and institutionalize best principles and practices on how DFIs should actualize their mandate of providing financial and technical assistance for sustainable development. Responsible corporate citizenship in a development finance institution (DFI), or alternately called development bank, is defined as “the governance of its positive impact on the economy, society and the environment through its operations, products or services, and through its interaction with key stakeholders such as its funders, employees and clients.” This actuation forms the crucial basis for DFIs to be responsible corporate citizens without which DFIs have little else to offer to society over the longer term.